I have had this for about 5 years or so and has worked well. I keep in in the basement closet which I also put a lock on, to keep the kids out of. Of course it won't keep anyone with any tools and any time to get into but that's not the reason I have it. Looks to be back in stock. How many rifles do these actually hold? 18 seems like a stretch. If you don't install the center divider/shelves, and also use those rifle rods, you may be able to get 18, in but it seems unlikley. Ordered one yesterday. It'll be perfect for the rimfires. Thanks for the post op. That’s the exact formula I use. Especially with most of my long guns having optics, other than my (non-deer hunting) shotguns. The manufacturers’ advertisements come dangerously close to false advertising or fraud. 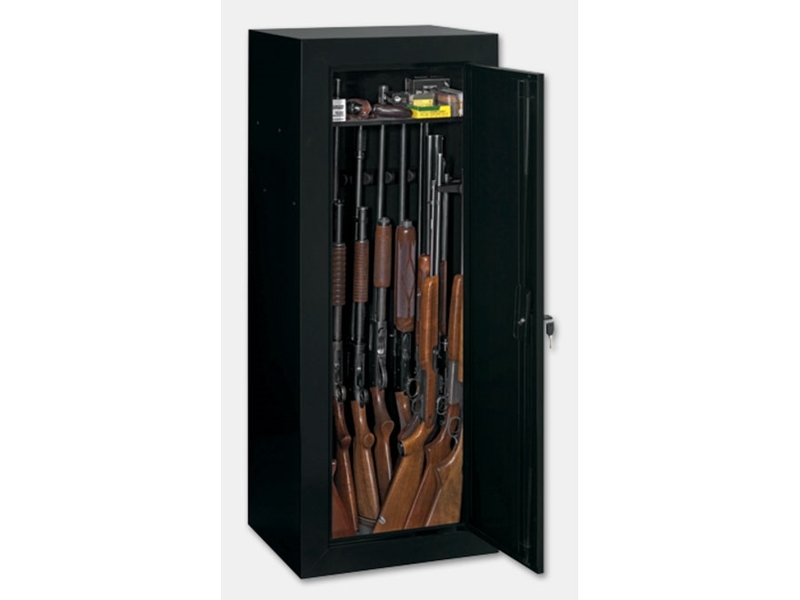 I too would love to see an 18 gun safe/cabinet that actually hold 18 of MY guns. Shame someone can’t make that happen, I think that would make them billions of $$ from us folk. Mine arrived this morning, cardboard box had some dings and dents in it but the actual cabinet seems fine. FedEx driver got a little nosey, asked if it was a refrigerator because of how heavy it was. Told him it was a filing cabinet to end his curiosity. I have the 8 gun with the two little ones attached to the top with 2 x 4 frame hold it all together. a lot harder to steel a 10ft total unit. Most of my ARs are in my M12 rack and roller base I made for it. I wish them luck trying to steal that, yes its on casters but the base its self weighs almost 100# and stairs out of the basement whether inside or outside.